Along with investing in the “white metal” directly, investors should also use this consolidation in silver to look at the silver miners, which offer excellent returns during silver bull runs. “Industrial demand is set to increase, driven by rising incomes and growing penetration of technology in populous, developing nations, as well as new uses are being found for silver’s anti-bacterial and reflective properties in everything from hospital paints to Band-Aids to windows”, reports Bloomberg, who expects the industrial demand to surge within the next few years. India and China will need approximately a billion smartphones and tablets by 2020. 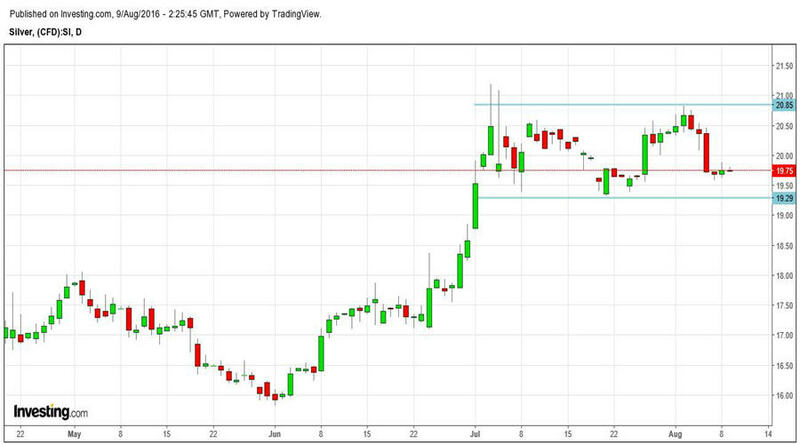 Demand for silver is expected to remain buoyant and demand will remain ahead of supply. “Over the next ten or twenty years, more and more people are going to be using these devices, however silver is a very limited commodity. “There’s just not a lot of it around” according to Keith Neumeyer, CEO of First Majestic Silver Corp. It is this that most likely is what led a major Japanese electronics player to First Majestic in attempts to secure its’ future silver supply, which is a sign of a tightening supply. “For an electronics manufacturer to come directly to us- that tells me something is changing in the market; I think we’ll see three-digit silver,” said Neumeyer to Bloomberg. The Solar industry is booming, as well. Solar power is taking over conventional power sources and that is good news for silver, as the solar industry is likely to consume more than 13% of the total silver demand in 2016. Similarly, ethylene oxide producers will also consume 25% more silver as compared to the previous year. "Silver demand had a phenomenal 2015, with retail investment and jewelry fabrication both reaching all-time highs," wrote Frank Holmes of US Global Investors in a post in early July 2016. On the other hand, silver mine production is expected to drop for the first time since 2002 as mining production dips 5% during the current year. 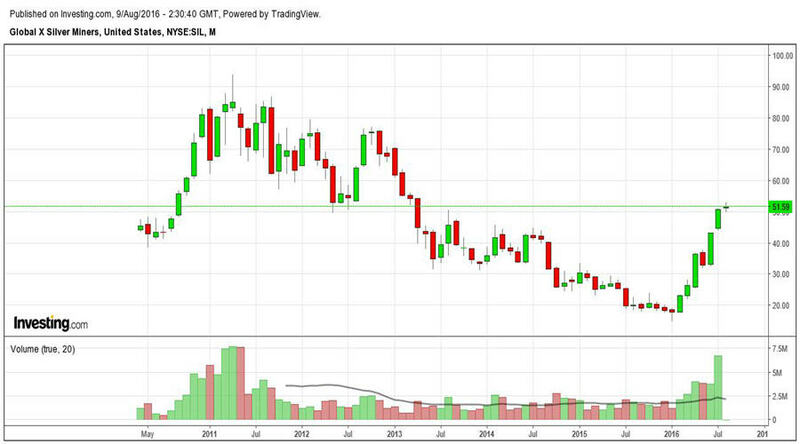 Why invest in silver miners along with silver? After having established that silver prices are likely to increase further, due to supply shortage and increased demand, let’s review the best possible mode of investment in silver so as to maximize our profits. During silver bull markets, the silver miners are favored by the investors while their prices increase much more than the price of the “white metal”. As the cost of production remains the same, the miners gain huge profits when silver prices move up. Hence, traders prefer the silver miners, once the next Elliott Wave count is confirmed. 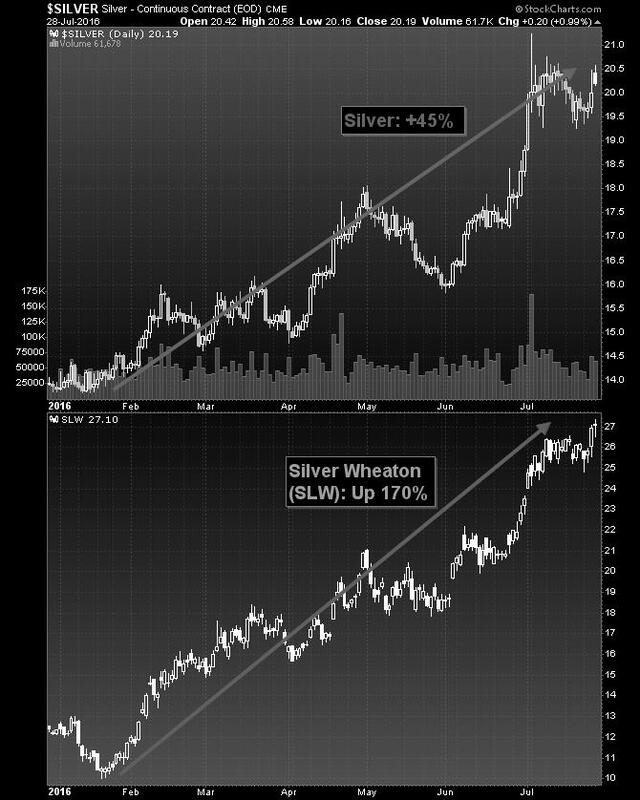 This is the reason for the sharp 170% run-up in the stock prices of Silver Wheaton (SLW), a "blue chip" silver-streaming company. For every $1.00 increase in silver prices, the silver miner has increased by more than $3.00, which indicates that the silver miners are a better trade than the underlying metal. However, when silver corrects, the silver miners tend to underperform the “white metal”. The silver miners behave as the leveraged plays of silver which are rising and falling far more than the underlying white metal is. The Global X Silver Miners ETF (SIL) offers an excellent opportunity to the investors to enjoy the advantages of the silver miners with reduced risk, compared to owning single mining stocks. 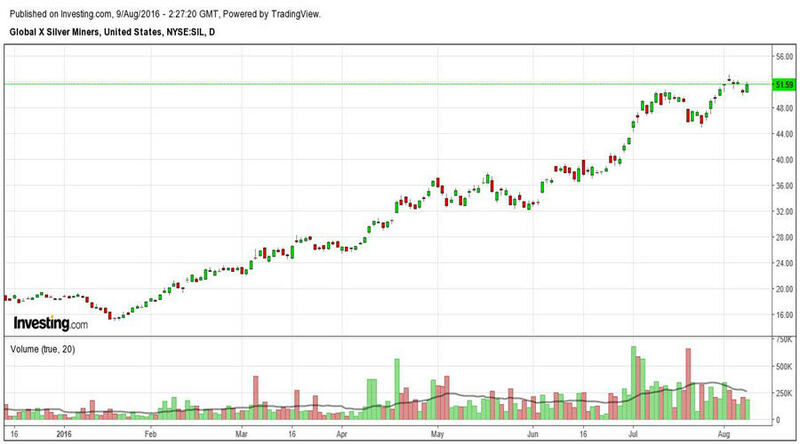 The ETF has seen a whopping rally from its’ lows of below $15.00 to the current price of $51.59. Traders can keep an eye on SIL to accumulate on dips. Silver has put a bottom in place and will continue to move even higher, in the coming months and years. In order to benefit from this rise, traders should keep an eye on the silver miners, which act as leveraged plays for the underlying ‘white metal’. With silver booming, silver miners’ prices will continue to skyrocket higher. However, every rally faces corrections, hence, the right time to buy is when the “risk-reward” is favorable. Keep following my articles and analysis for the right time to enter this ETF.